The Auckland District boundaries are effectively from the Tamaki river in the south to Orewa in the north, and coast to coast in between, including Helensville in the West and Howick in the East. We also include Waiheke Island. This covers a large part of Auckland City, the largest city in New Zealand. Within that area are 29 Lodges, covering Daylight Lodges, dining Lodges and supper Lodges. Although the first Lodge meeting was held on a warship in Akaroa Harbour in 1837, the first official Lodge in New Zealand granted a dispensation from the Irish Constitution on September 5th 1841. It was known as The Auckland Social Lodge and subsequently changed its name to Ara. 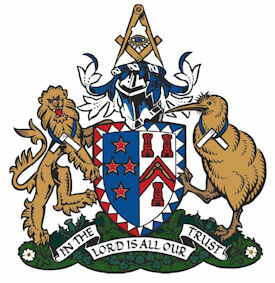 When the Grand Lodge of New Zealand was formed, although the original Lodge remained loyal to the Grand Lodge of Ireland, members of this Lodge formed Ara Lodge under the New Zealand Constitution and received the number 1. The Ara Lodge No 1 is still a very active Lodge, with a great history of support for the craft. A number of years ago a substantial three story Lodge building was built in St Benedict street and served as the major centre for Freemasonry in Auckland for many years. More recently, this was sold and another newer three story building was bought in Khyber Pass Road. The Building has two floors of commercial space, with the third floor taken up by two Lodge rooms, a refectory room, commercial kitchen, and a committee room. The floor is completed with our museum and substantial library, which is well cared for by the Masonic Heritage Society. The library is open to the public as well as all Masons. There are also Masonic buildings owned by Lodges in the New Zealand Constitution situated in Orewa, Albany, Birkenhead, Kumeu, Henderson, Mount Roskill, Onehunga, and Howick. Our Lodges also use buildings owned by English Constitution Trusts in Balmoral and Ellerslie. With all four Constitutions represented by Lodges in Auckland, there are also other Masonic buildings in the centre of the city and Onehunga. In total, over the four constitutions, there are 42 Lodges in the Auckland District.